Marin Čilić rose from obscurity to become a legendary tennis player, ranking among all-time greats in the sports. He currently ranks at No.7 and caused quite a stir when he took out the World number 2, Andy Murray in round four of 2009 US Open. Marin Čilić, the son of Zdenko (father) and Koviljka (mother) Čilić was born on September 28, 1988. As he’s the third son, he has two older brothers (Vinko and Goran) as well as a younger one named Mile. Born and raised in Medugorje, Herzegovina in present-day Croatia, Marin’s father nudged his three sons in the direction of the game of tennis in which Marin showed great promise at the tender age of 7. When he was 8, he won his first trophy in his hometown and has never looked back since then. Excelling among his peers in the game, Chila (as he’s fondly called) attracted the attention of indigenous coaches in his early teens and they helped him move to Zagreb which was a more prominent location for the game. It was there that he met Goran Ivanisevic, a former Wimbledon Champion who took him under his wings and introduced him to a larger arena. Fast forward to 2007, Marin Čilić triumphed in two professional tourneys of his young career, this was in April and May. Also, he defeated Benjamin Becker of Germany in the international Davis Cup while representing Croatia in the 2007 tournament. The next year, he made it to the fourth round of the Australia Open but was defeated by James Blake. Nonetheless, it didn’t stop him from climbing into the top 40 that year. In 2013, Marin employed his mentor Goran Ivanisevic as his coach. The next year, he won his very first Grand Slam at the US Open. He defeated Andy Murray in 2016, winning his first Masters title. Marin Čilić continued his impressive career run and eventually attained his career-high singles ranking on 28 January 2018 when he climbed to the world No. 3 spot. He was seeded first in 2018 Grand Slam but performed dismally and was ousted by Gile Simmons in the semifinals of the game which took place in Pune, India. Čilić made it to Grand Slam where he faced Roger Federer in the finals of 2017 Wimbledon. He was defeated by Roger in the entire sets of the game though he made history as the very first Croatian player to reach the final in the Melbourne park games. Fired up, the talented star put up an outstanding performance when he faced veteran Rafael Nadal who pulled out in the middle of 2018 Australian Open due to an injury. In the same power play, he got to the quarterfinals of the 2018 US Open but lost to Kei Nishikori and blessedly, he was compensated in the same 2018 when he won his 2nd Davis Cup Championship. Marin Čilić lost to Novak Djokovic in the Paris Masters of 2018 though he managed to win one set out of four, denting the Serbs’ 30 set winning streak. Marin Čilić is said to have earned about $25,240,425 as career prize money. He also earns extra income from endorsement deals with brands like Li-Ning, Line Head and Fila. It is believed that he earns over $4 million annually and that his net worth is as much as $17 million. As a way of giving back to the society, Marin launched a foundation aimed at providing less privileged children with good education. He also sponsors a tennis academy for young upcoming talents. Marin Čilić is married to Kristina Milkovich, his only known girlfriend. They met in 2010 and had been dating till they tied the nuptial cord in April 2018. Kristina holds two Master’s degrees in political science and psychology. In an interview, Marin jokingly refers to her as his personal psychologist. She presently heads the human resources department of Q Software Company. She’s a polyglot career woman as she speaks English, Croatian, Italian, and Spanish fluently. Marin refers to her as his lucky charm as she was with him during his most memorable victories. They do not have any children yet. 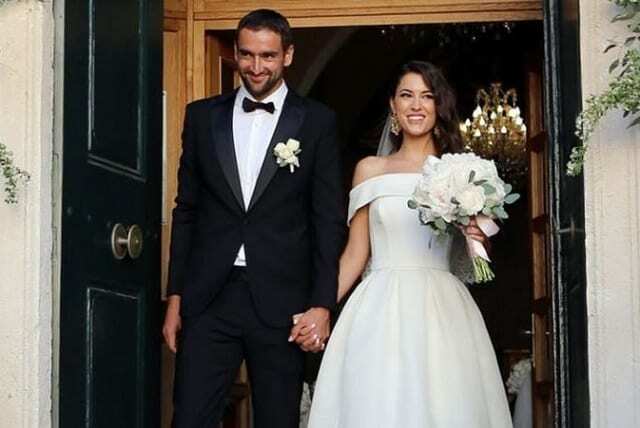 Marin Čilić has a typical tennis player body; a slim and fit physique that boasts of a height of 1.98 m (6 feet 6 inches) and a weight of 196 lb (89 kilograms).